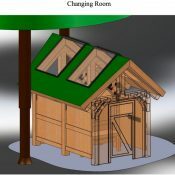 Click the image for a link to the documents. When the basics of biking are essentially passed on as folk wisdom from one individual to another, is there any wonder so many of us fail to pick up the best practices? Local programs like Safe Routes to School and Create a Commuter try to fill this gap for elementary schoolers and working-age riders, respectively. 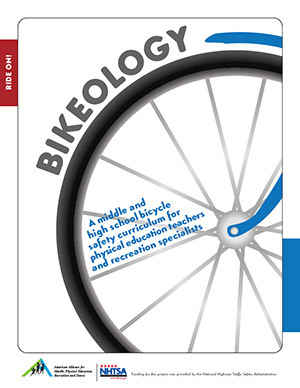 And now the federal government is offering a free three-part guide aiming to help middle school and high school “physical education teachers and recreation specialists” teach the basics of bike use, maintenance and safety. There’s also a 34-page guide aimed at parents, with slightly more detailed information and advice. 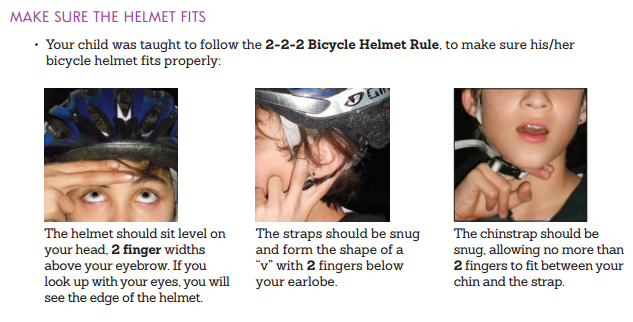 Helmet fitting tips from the parents’ guide. The guide is a project of the National Highway Traffic Safety Administration and the American Alliance for Health, Physical Education, Recreation and Dance. It’s certainly not a much of a marketing document. “Bicycles are associated with more injuries and deaths than any other consumer product other than the automobile,” the curriculum points out in a characteristic section urging every bicycle rider to use a helmet for every trip. If I received the curriculum or parent’s guide without having already decided that it was a good thing to get my students or children on bicycles, I’d be terrified: none of the documents has a single photo of people enjoying themselves, and it’s left to instructor and students to come up with ways to convey the pleasures and advantages of biking in addition to the tasks, responsibilities and concerns. That said, it’s great to see the federal government making a serious effort to aid bike education at an age when we build our first transportation habits and too many girls, in particular, tend to abandon the activity. With Portland’s own Safe Routes to School program expanding into middle schools this year, hopefully it’ll be a useful tool. 355 pages – on bicycling….. Seriously, this is one example of how and why our education system is so screwed up. Can you share how you would make the curriculum different? I don’t understand your criticism. I’ve ridden bicycles on a regular and frequent basis since I was a little boy. Freestyle bmx was even my primary joy throughout adolescence and early adulthood. Even so, my worldview has changed dramatically since I started riding bicycles for transportation in 2007. My approach bicycle commuting has slowly developed over all the years as I’ve interacted with other cyclists, read countless articles pertaining to it, and thoroughly pondered it, but still I frequently come across new ideas related to the travel mode. Maybe those pages just have large margins, fonts, images, headers, and plenty of empty space, but maybe 355 dense pages wouldn’t even be comprehensive enough for those who had neither experience in nor a mind for cycling to begin with. Please insert “to” after the word “approach” in the above post. Agreed, this would be absurd if it were intended for student consumption. But it’s the teachers’ guide, and it’s up to the teacher to interpret it in a class setting where — one hopes — there will be more riding time and less reading time. I only skimmed the parents’ guide. A lot of the info is OK, but I don’t like the subtle messages telegraphed by some of the helpful hints. Maybe they are appropriate for the age level; kids don’t draw nuanced distinctions the way adults can in the face of messages like “Helmets are for everyone”, “bicycling is ‘inherently’ dangerous”, “Same rights and responsibilities”, etc. To me, all of these statements are false, but I understand about being more absolute with kids and letting them figure out some of the subtleties later. Heck, I’ve even tried to convince my kid he doesn’t have to wear his helmet to ride his kick bike around on the back patio, but he won’t hear any of that nonsense–it’s helmet or nothing already at the age of 3. There is one section in the parents’ guide about how to prevent crashes, and how to prevent brain injuries. The first bullet point under “YOU AND YOUR CHILD CAN PREVENT A BRAIN INJURY BY:” is “Wearing a properly fitted bicycle helmet every ride”, when it should be “Avoiding crashes, as described in the previous section”, followed by “wear a helmet”. This same section then goes on to describe brain injuries and concussions in great detail. I mean, I got to watch plenty of “Red Asphalt” films in driver’s Ed., but I think all the brain trauma details fall into the same fear-mongering category as the quote that Michael pulled out in the post (which is not from the parents’ guide, but from the actual student curriculum). It’s sad that there is a section that includes parental advice on “ask[ing] your child about peer pressure and fears of teasing by peers for wearing a bicycle helmet.” The advice is to “Role-play to enhance his/her self-confidence to stand up for themselves if the situation [of being harassed] arises.” To me, it is pathetic that a) children have to be legally sentenced to wear something that will likely result in more teasing than actual protection from anything, b) said sentence is something that has been brought on by adults unable to be responsible for their own (driving) behavior, and c) looking like a dork (or perceiving yourself as) is a now a prerequisite for doing something that kids have been able to freely enjoy for almost a century with about the same consequences as for climbing trees. Don’t get me started. 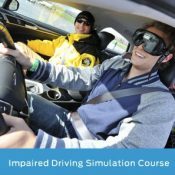 I do like the focus on driver behavior and the fact that it is driver behavior that creates a lot of the danger for cyclists, and I think there is some good technical info related to safety checks and bike handling; I just wish there wasn’t quite as much fear-based instruction included. Kids will discover how scary cars are all by themselves I think. I did, and I didn’t have to get run over to come to the conclusion that a car can hurt me. Excellent comments – I think for the target age group the helmet subject could be summed up as “Wear your helmet because it’s required by law and may save your brain if you fall.” Not only would I discourage the fear-mongering but I’d encourage feedback to the publishers of this curriculum at http://www.aahperd.org/about/contactus.cfm – especially if you’re a parent of children this age. The League of American Bicyclists has a decent youth instruction manual – my first thought was that AAHPERD should partner with them to review this guide and unify some of the teaching principles and terminology, but I do notice the authors and design consultants are League-Certified Instructors. Yeah, I strongly detest the way many people talk (and perhaps think…) about “inherent danger”. If bicycles are “inherently dangerous”, then existence is “inherently dangerous”, but how many public safety advocacy organizations promote life as “inherently dangerous”? If they don’t promote it that way because it’s a given, then what would be the use in promoting the corresponding given that bicycling is “inherently dangerous”? I don’t think this kind of instruction can be taught the same way from 6th-12th grades. I am currently a senior in high school, and let me tell you that this material would be “OK” in middle school, but a lot of kids would be offended by the simplicity of instructions and the like, especially with most of the photos being of smaller children. Many of the activities and exercises are just too “dumb” for high school students. There should be separate guides for middle and high school because the way you teach a high school student is very different from how you would approach a student in middle school. I feel this guide is definitely more appropriate for the Middle school level student than for high school. I also agree with Pete, there should be fewer negative connotations about cycling inside the curriculum guides. It makes riding a bike seem as dangerous as being the duck in a shooting gallery. Um.. are cigarettes not a consumer product? They kill more people than even automobiles. I’ve only skimmed the guide. It seems OK, though it would be difficult for a teacher to organize the lessons into a whole to fit the available time frame, as there is insufficient information about priorities. The parent guide is junk, full of misinformation. The helmet emphasis throughout was probably forced by the funders, National Highway Traffic Safety Administration, which continues to push the helmet koolaid without context. Anyway, worth looking at for educators. Of the school of, “Wear a helmet or you WILL DIE!” programme to encourage the safe and healthy activity of cycling. But, regardless of that particular factor, it seems, on a (very) cursory skim thro’, to be a pretty thorough cover of many of the basic skills required for safely riding a bike. Unfortunately, much of it is a tedious repetition of the need to check helmets, etc. before every session, which bulks out the document enormously. Strip those out by simply referring to the original section and it would thin it out considerably. And, given the ease with which video footage can be reproduced, it seems a pity that the curriculum material couldn’t be re-cast in a more 21st century format. I just had this Bikeology link sent to me by a friend at the NY DOT. I authored a Safe Routes to School Grant that, in part, encourages bicycle safety and using bicycles to commute to school. That task is complicated by the fact that our city has a refugee/immigrant population that makes up 25% of the city residency. One in four resident families in Utica, NY do not speak English as the primary language at home. The School District teaches classes in 41 different languages. The refugee/immigrant population come from very different background with varying levels of experience and many rely heavily on bicycles for transportation. Any standard program for bike safety education is a dream with those linguistic and cultural barriers in the way. Every plan has to be tailored to the divergent cultures and languages. That being said, I was happy to find the information on this site. Any collection of information that can lead to a new approach is welcome. I understand the concerns of all who read and commented on the scare tactics that the NHTSA and others in the safety business use to promote helmet use. If they use it often enough it will be counterproductive. That scares me. I am looking beyond that approach to see an alternate reference that Physical and Health Educators can use for input information into their respective programs. Too many local school districts have used the old Bike Helmet Giveaway as an education vehicle for too long. They need to change and approach the issues of bicycle safety as a life skill and not just as a mandated task that they have to accomplish annually. Maybe the ideas complied in this curriculum can have the right influence and help more educators open up to taking new safer and more current approaches. For our program, we are pursuing Bike Rodeo kits that the district can use semi-annually every year as education tools. It’s a real change of direction for us but I hope it catches on. Who knows, maybe genuinely relevant and useful education still has a place in our world?